Born: 1955, Youxi County, Fujian Province. Education: A first degree in political economics from Fujian Normal University (1970s), and a Masters in Law (1990s). Career: Various roles in Fujian and served for many years (1999-2014) in Zhejiang, both Provinces where Xi Jinping was Party Secretary. Was moved to Beijing in 2014, apparently to work at the National Security Commission, a body established and led by Xi Jinping. Acting Mayor of Beijing in 2016, and Party Secretary since May 2017. Prospects: Promoted to the 19th Politburo. His rise since 2014 has been dramatic. Relevance to Tibet: None directly but Cai Qi is close to Xi Jinping. 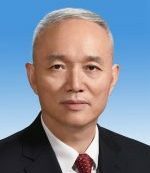 Cai Qi is rare among Chinese politicians in that he has been promoted to the Politburo without first serving on the Central Committee. His rise since 2014 has been stratospheric. Address: Party Secretary of Beijing, Municipal General Office, No. 2 Zhengyilu, Dongcheng District, Beijing 100744.